With each passing year, homeowners become more and more concerned with the overall energy efficiency of their homes. This is with good reason, I assure you. What, with the rise in cost for heating and air conditioning, it is no wonder the typical homeowner is now demanding their windows and doors be highly energy efficient—no one wants to pay extra to remain comfortable indoors! Now, I could explain several ways residents here in Toronto, ON, could improve the thermal insulation in their homes. Though, one of the most effective ways to address skyrocketing heating and air conditioning bills is to swap your outdated windows with replacement windows from Brock Doors and Windows. That said, I recognize that a whole-home window replacement in Toronto, ON is easier said than done. Shopping around can yield confusing and conflicting options—which can easily feel overwhelming. To assist you, our experts here at Brock want to share with you a handful of options we offer to help you save money on your bills! Keep reading! This may or may not be a term you are familiar with. Low-E glass refers to a coating applied to the glass of a window (undetectable by the naked eye) which pushes heat back in the direction of its source. So, during the cold months—the long, long cold months we experience here in Toronto—the heat isn’t lost through the glass, it is “bounced” back into the home. And during the warm months, the heat is reflected back in the direction it came: the sun. This is a unique specification that offers incredible energy efficiency. Triple-glazed windows from Brock utilize three panes of glass to significantly reduce condensation and thermal transfer between the indoors and outdoors. This option is as much as 60% more effective than double-glazed windows, which are lauded highly in the industry for their thermal protection! You don’t have to be a scientist but do think back to your school-age years when you first learned about greenhouse gases and their effect on the warmth of the planet. The concept of trapping gas between two panes of glass works much the same way. At Brock, we offer two options: Argon and Krypton. Argon gas: this is an inert, slow-moving gas which helps to prevent heat loss. Krypton gas: also an inert, slow-moving gas (though, denser than Argon) which improves thermal performance. In other words, this glass isn’t entirely transparent. Here at Brock, we offer two options: frosted and glue chip. These two options are great for bathrooms and any other space where transparency is not needed. Both options are effective “shields” without completely shutting out natural light. Just as it sounds, this option provides a tint to reduce the amount of glare and heat entering into your space. 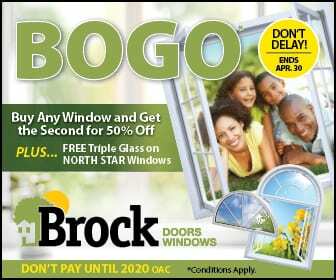 If you are concerned about your home’s current energy efficiency, come see us here at Brock Doors and Windows! We would love to help you resolve this issue in your home!